All you salmon lovers be prepared to fall in love, this Maple Glazed Salmon recipe is about as easy as them come and it turns out tender and rich with flavor. You will love every bite. 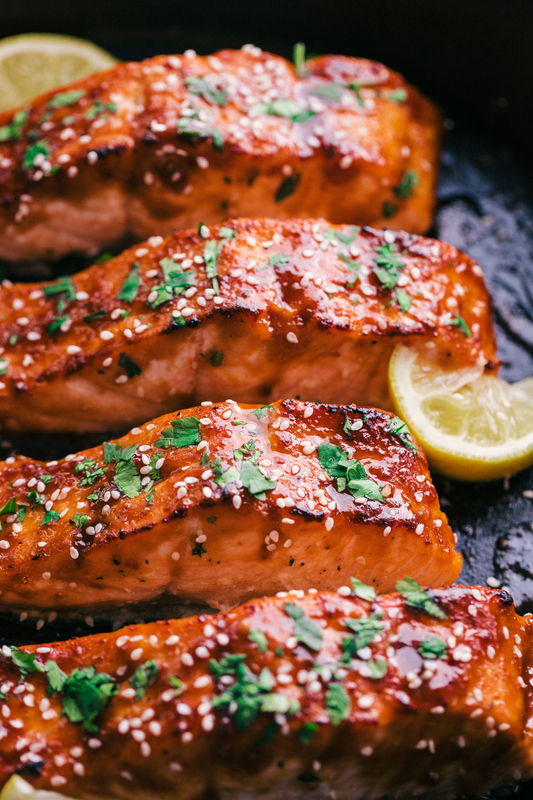 Salmon, the delicious and flavorful omega 3. 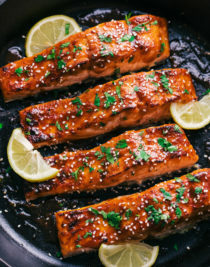 Not only does salmon have so many good sources of nutrients for us, it tastes amazing and this Maple Glazed Salmon recipe has got to be my favorite. Can you imagine a soft, flaky inside and a warm caramelized maple outside all together in one bite? Well stop dreaming and start eating because that is exactly what you are going to get from this salmon dish. Oh, did I mention it only takes 7 minutes to make? It’s unreal, I haven’t had a better tasting and perfectly cooked piece of salmon at home until now. This Maple Glazed Salmon is phenomenal and I can’t stop raving about it to my family and friends. The mixture of the glaze on the outside as it caramelizes and forms a thin crust around the salmon is really what sets your tastebuds off. Eating this salmon produces that “I can’t just have a bite” feeling, I have to keep eating even if I am full, it really is that good. I love to serve this as a main dish, so I pair my Maple Glazed Salmon with rice, but you could certainly eat it on it’s own, or serve it with a vegetable or a side of pasta. Really you can’t go wrong. Make it once and you will love it, and find yourself making it again and again. Start off by making sure you get good salmon fillets. Try to avoid farm raised if at all possible. You really want wild caught salmon. By patting your salmon dry it will prevent the fish from getting tough and mushy. Make sure to move your oven rack about 5 inches away from the heat source when broiling. Try not to open the oven door while broiling, if you need to see and have an oven light, use that. Brush the fish a few times over with the maple glaze to get a good amount cover the top and slightly down the sides. If you have any left over or want to make a little more glaze, you can brush the fish with more after you take it out of the oven as well. Don’t over cook your fish, so make sure to only leave it in for 2-3 minutes once you have added the glaze to it. It will continue to cook a bit after you take it out of the oven. You don’t have to flip the fish, put make sure to broil it with the skin side down. If food tends to stick to your skillet, wipe it out with a little bit of olive oil before you start cooking so the fish won’t stick to the bottom. How long do you broil salmon? When broiling salmon make sure the top oven rack is placed about 5 inches away from the heat source. For most ovens that will be the highest the rack will go. Pat salmon dry and season as desired. Looking for more Skillet Recipes? 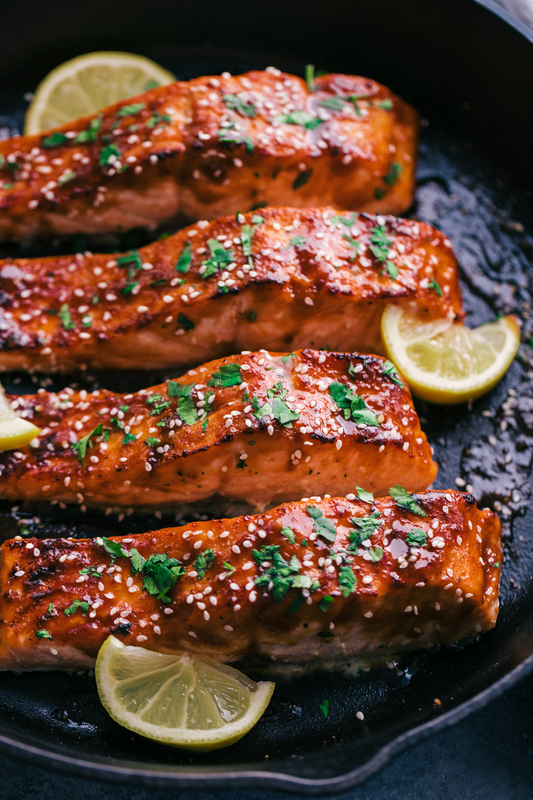 Place your salmon fillets skin side down in a 12 inch cast iron skillet, pat dry, and sprinkle with garlic salt. Place in the oven and broil on high for 5 minutes. 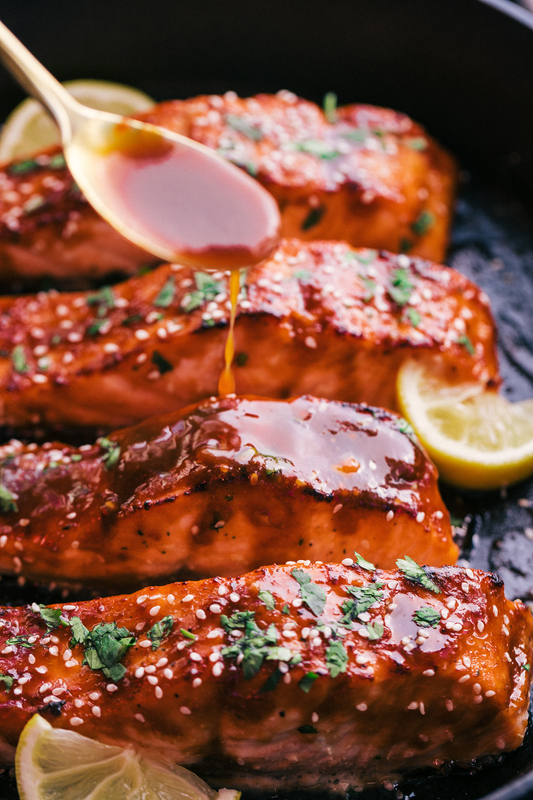 While salmon is broiling, mix the miso, maple syrup, rice wine vinegar, and chili paste in a bowl, set aside. Remove salmon from oven and baste with maple syrup mixture, place back in oven and broil for 3 more minutes on high. Remove from oven and garnish with sesame seeds and cilantro. Serve hot over white rice.